Nothing is better on a cold winter day than a hearty soup. 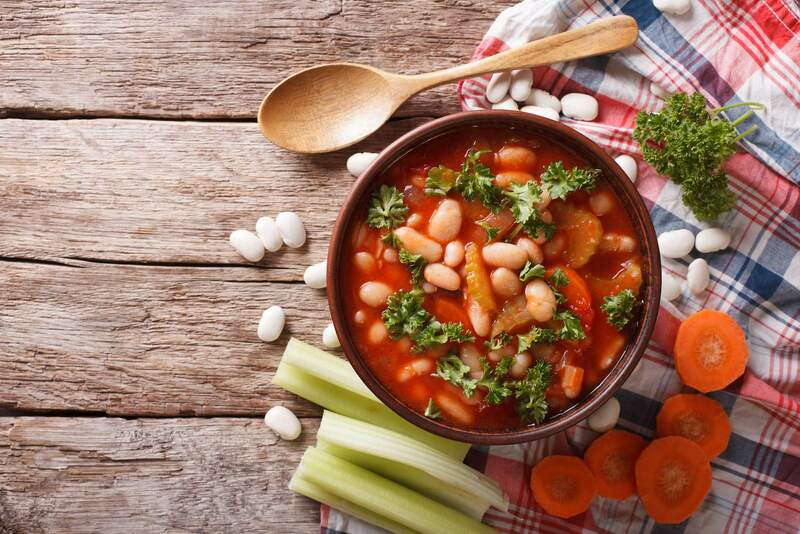 Check out this recipe for Fasolada, a traditional Greek soup made with white beans. This recipe is full of olive oil goodness and also high in fiber, vegan and gluten free. You can make it on the stovetop, in a slow cooker or an Instant Pot/electric pressure cooker. If cooking on a stovetop, you must first soak the beans. Rinse the beans and pour into a large bowl. Cover with 2" of water, 1 tablespoon of salt and let soak on the counter for 4 hours -12 hours. In a large pot, starting with a cold pan, sauté the onion, celery, carrots and garlic in 2 tablespoons of olive oil. When the vegetables are aromatic, add paprika. After 2 minutes, add the diced tomato and sauté for 1 minute. Add the soaked beans and cover with enough water to cover the beans by 1 inch. Simmer until the beans are tender (30-40 minutes). Add 1/2 cup of extra virgin olive oil and cook for a few more minutes. The olive oil will make the soup thick and creamy. Add onion, celery, carrot and garlic to the pot. If you can, sauté them first, but you don't have to. Add the diced tomatoes and paprika. Add beans and enough water to cover by 1 inch. Add 1/2 cup of olive oil. Using a spoon, smash some of the beans to thicken the soup. Press the sauté button. Add 2 tablespoons of olive oil and sauté the onion, celery, carrots and garlic. After 2 minutes, add the paprika. After 1 minute, add the diced tomato and sauté for 1 minute. Add the beans and enough water to cover by 1 inch. Press the cancel button to turn off the sauté mode. Press manual for 40 minutes. Make sure the pot is sealed. When done cooking, natural pressure release for 10 minutes or until the pressure pin drops. Open the pot and add 1/2 cup of olive oil. Stir. Put the machine back into sauté mode and let the soup simmer for 5 minutes. Taste the soup and season with salt and pepper. Serve in bowls with crusty peasant bread, olives and feta cheese! This soup, like many soups and stews, tastes even better the next day.